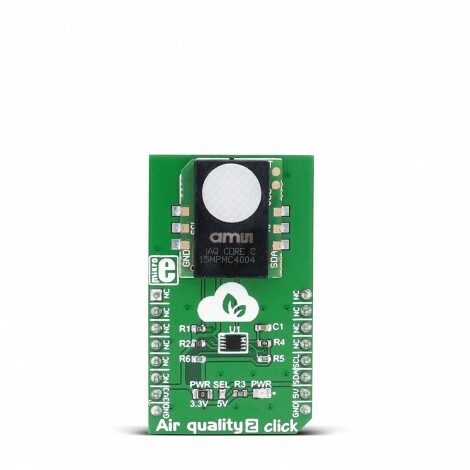 Air quality 2 click carries the iAQ-Core Indoor Air Quality sensor that measures VOC levels and provides CO2 equivalent and TVOC equivalent predictions. The click is designed to run on either 3.3V or 5V power supply. 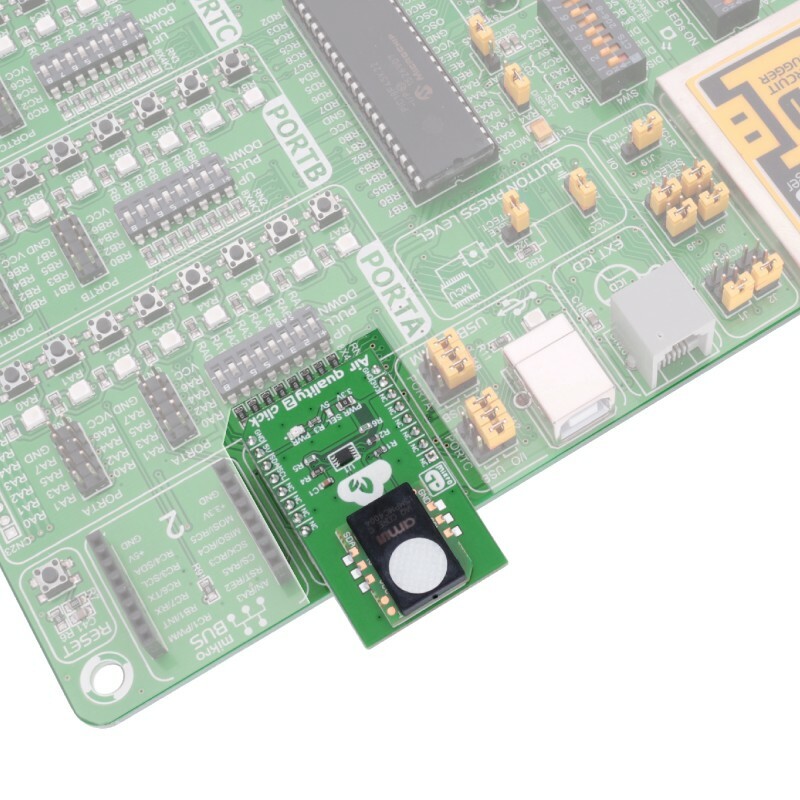 It communicates with the target MCU over I2C. 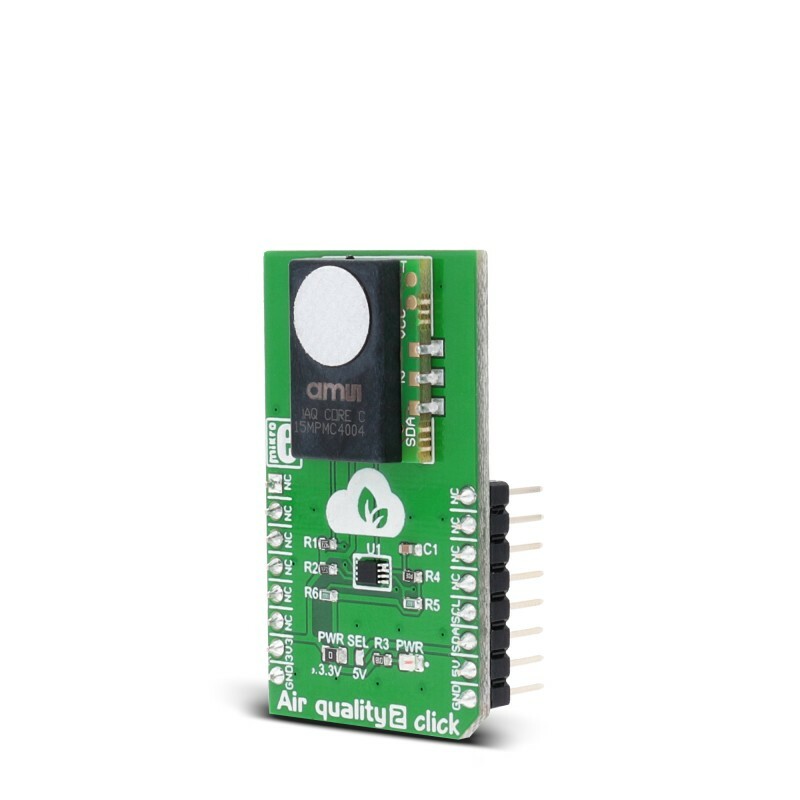 Air quality 2 click carries the iAQ-Core Indoor Air Quality sensor that measures VOC (volatile organic compounds) levels and provides CO2 equivalent and TVOC (total volatile organic compounds) equivalent predictions. The click is designed to run on either 3.3V or 5V power supply. It communicates with the target MCU over I2C. The sensor is protected by a plastic cap and a filter membrane. This membrane should not be removed or touched. The sensing range for CO2 equivalents is from 450 to 2000 ppm (parts per million), and from 125 to 600 ppb (parts per billion) for TVOC equivalents. It takes only 5 minutes for the first functional reading after start up time. After the sensor is powered on, you don't have to wait for it to calibrate. You'll have all the readings you need in less time than it takes to make a cup of coffee. iAQ-Core sensor has Automatic Baseline Correction (ABC), which means that you don't need to make any further calibration. You'll be able to use it for many years in a normal indoor environment. With low power consumption (maximum of 9mW in pulsed mode and 66mW in continuous mode) Air quality 2 click is ideal for Smart Home applications and IoT projects and devices that require long battery life. Volatile organic compounds or VOCs are organic chemicals. They have very high vapor pressure at room temperature, and some of them can be harmful to human health. These chemicals are carbon-based (formaldehyde, toluene, benzene, etc.) and they got the name "volatile" from the fact that they become gases at room temperature. They are emitted from various products, like hairspray, household cleaning products, paint, or air freshener, that we use every day. CO2 equivalent or CO2e, represents a unit of measurement for the amount of CO2 present in some "greenhouse gas". Applications Smart Home applications, Internet of Things devices, HVAC, thermostats, etc. Key Features Low power consumption, measures VOC levels and provides CO2 equivalent and TVOC equivalent predictions. Key Benefits Reliable evaluation of indoor air quality, high sensitivity and fast response. 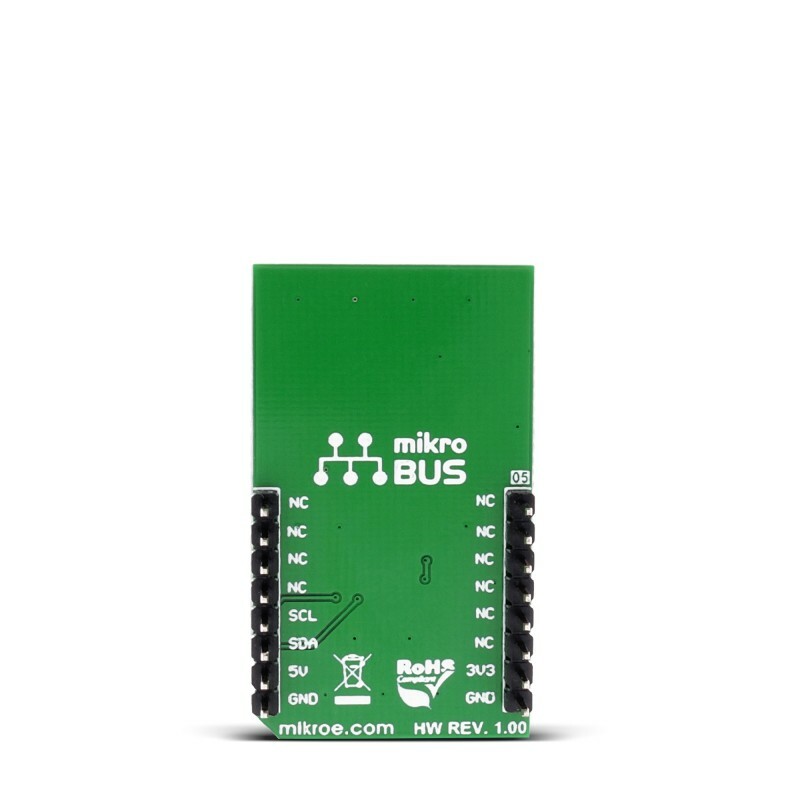 This table shows how the pinout on Air quality 2 click corresponds to the pinout on the mikroBUS™ socket (the latter shown in the two middle columns). 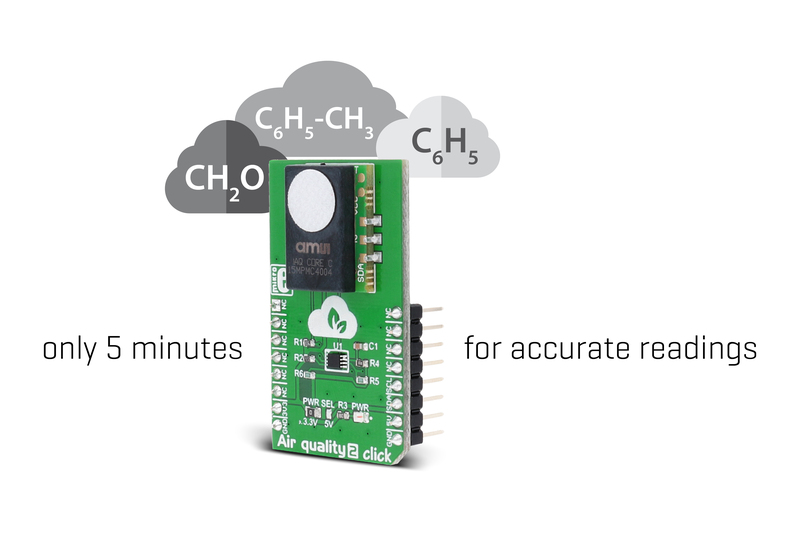 Code examples for Air quality 2 click, written for MikroElektronika hardware and compilers are available on Libstock. The library has a helper function to read the iAQ-Core sensor measurements. The demo initializes the library, and in an endless loop reads the measurement data, and writes them to the UART. The code snippet shows how to initialize the library and use the helper function to read measurements data from the iAQ-Core sensor.